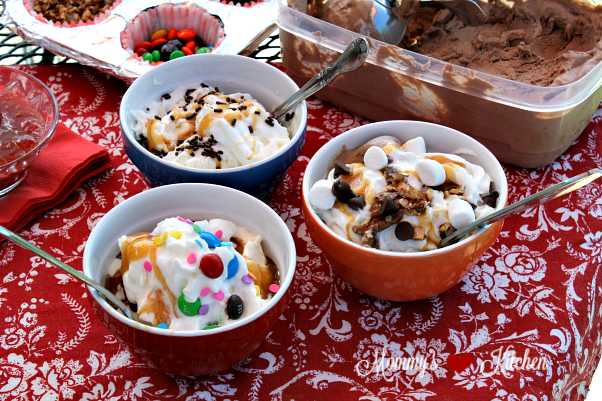 A perfect way to celebrate summertime... No Churn Chocolate & Vanilla Ice Cream and DIY Ice Cream Sundaes! If there is one treat that everyone loves during summer it's Ice Cream!!! Cold, creamy ice cream is a must have in surviving the dog days of summer. My family spends a lot of time outdoors during summer, so keeping cool is a must. We love cooking out, grilled desserts, s'mores in our fire pit, and making homemade ice cream. Most times we use our favorite Nostalgic Electric Ice Cream Maker, but I have to say using a no churn recipe is just as delicious and fun. 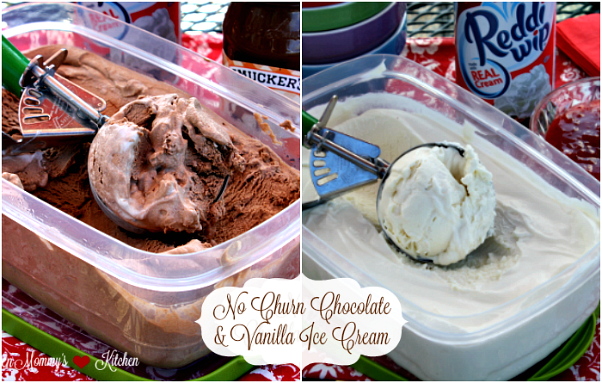 Last weekend while the kids and I were grocery shopping at Walmart, we picked up everything we needed to make this easy No Churn Chocolate & Vanilla Ice Cream. 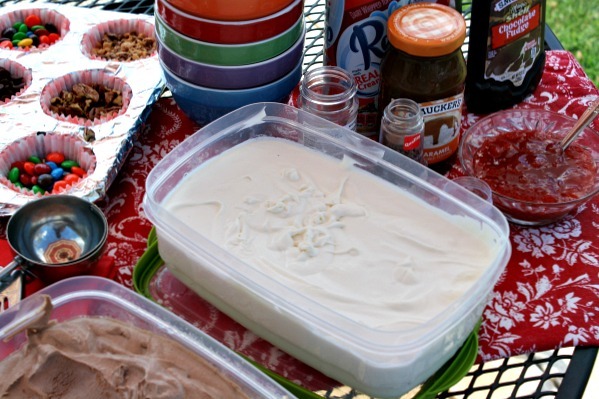 Initially we just wanted to make homemade ice cream, but I thought it would be fun to pick up some sundae essentials and make our own ice cream sundaes as well. When my kids were younger they loved filling the ice cream maker with ingredients and watching it go round and round and turn into ice cream. 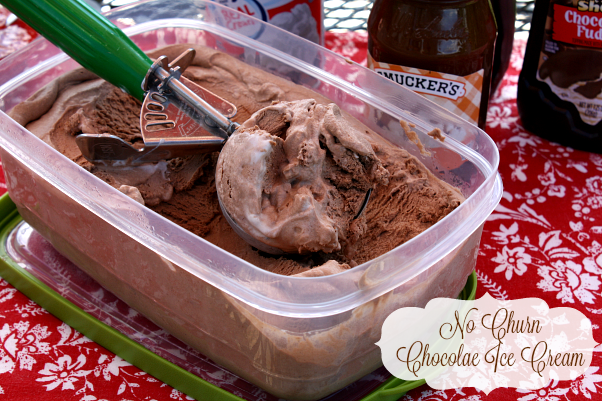 Well, this easy no churn ice cream is just as sweet and smooth, and perfect for DIY Ice Cream Sundaes!!!!! I was a bit skeptical on this 3 ingredient ice cream recipe, but I'm here to tell you it taste exact to ice cream churned in an ice cream maker, but so much easier. 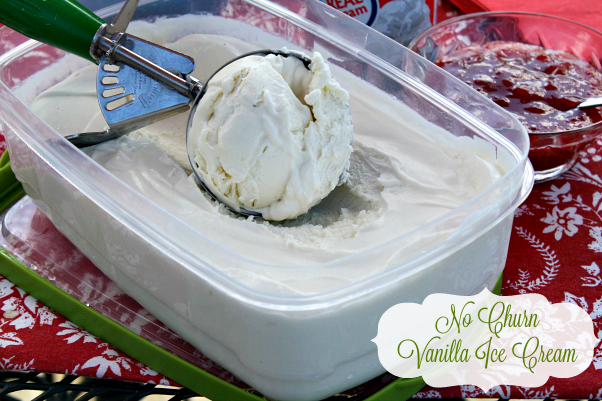 This no churn ice cream cost pennies to make. I purchased everything I needed at my local Walmart, and all the ingredients came in under $10! This recipe yields approx 1 1/2 quarts of ice cream for each flavor. These are the items you will need: Ice cream storage container, heavy whipping cream, sweetened condensed milk, vanilla extract (good quality) and unsweetened baking cocoa. 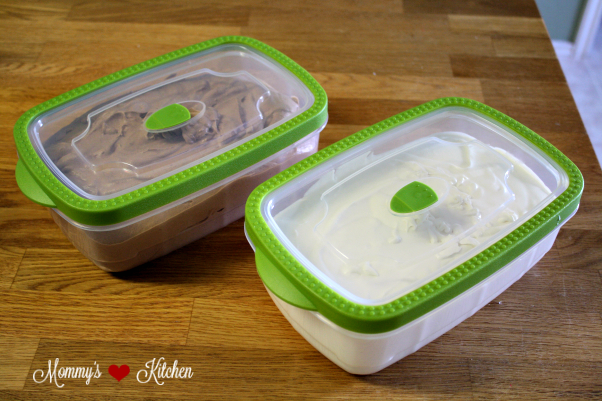 These Mainstay Rectangle Storage Containers are the best and affordable ($3.92) storage tubs I have found for homemade ice cream. 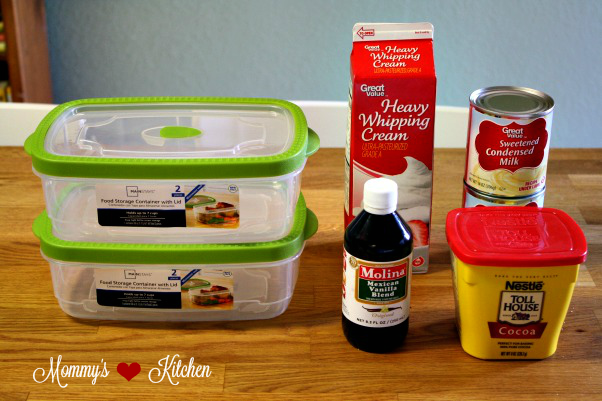 This recipe makes 6 cups, so these containers are perfect with a 7 cup storage capacity. Once the ice cream is firm it's so easy to scoop the ice cream out of. They're also BPA free, microwave, freezer and dishwasher safe. I picked up several extras because they're also great for fruit storage and have vented lids when microwaving. 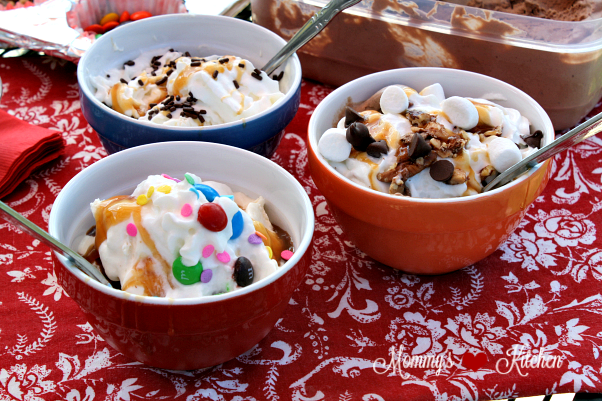 Once you have your ice cream prepared and frozen, it's time for some sundae making fun. Whether your enjoying your ice cream sundaes indoors or outdoors, you'll want to make sure to set everything up in one area. Make sure to have all of the ice cream scoops, tableware, ice cream, toppings, fruits, nuts, and sprinkles available so everyone can easily prepare their ice cream sundaes. 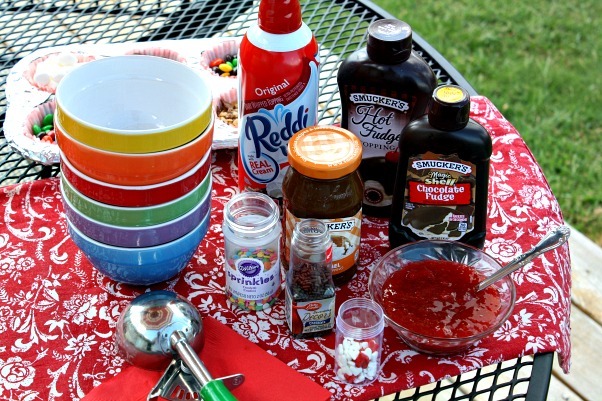 I have included a list below of some of my favorite ice cream sundae toppings. Once everything is set up just sit back, relax and let everyone enjoy their sundae creations. Whip the cream with an electric mixer or kitchen aid mixer on high speed using the whisk attachment. Mix for about 2-4 minutes until stiff peaks form. Fold one cup of cream into the sweetened condensed milk, using a rubber spatula until combined. Add the mixture to the remaining cream and lightly mix to combine. Pour into a chilled 9 x 5 inch loaf pan or similar plastic container with lid, cover with plastic wrap (if using loaf pan), and freeze until firm (about 5 hours or overnight). Remove from freezer 30 minutes (to soften) before serving. Cook's Note: if you would like to add flavor additions to the ice cream, freeze until partly softened and fold in any flavor add in's of your choosing (crushed oreo cookies, nuts, candy, fresh fruit, etc). Place back into the freezer and continue to freeze until firm. If you would like to plan an Ice Cream Sundae Party, stop by the Food & Celebrations page on walmart.com for an easy Sundae bar check list. Disclosure: This post is a sponsored post on behalf of Walmart. I have been compensated for my time and efforts in creating this post. All opinions are my own. 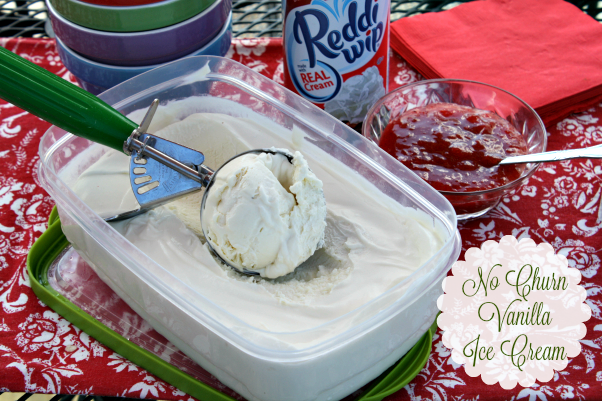 I LOVE making this easy ice cream in the summer too! Your sundaes look so yummy and fun, I'm going to have to get some started today.